If Your Single and You Know It Clap Your Hands! …eww sicko, I am referring to Valentine’s Day of course! That greeting card, flower & chocolate endorsed holiday. The day that singles love to hate and [most] couples love to love. Honestly, I am indifferent about Valentine’s Day. Yes, I have recognized it while in a relationship, but there was never any pressure like, “YOU BETTA GIVE ME A TEDDY BEAR & FLOWERS & SH*T.” Better yet I wasn’t ever forced into a Tammy-I-Don’t-Spread-For-No-Roses situation. The same can be argued about events like Father’s & Mother’s Day or even birthdays- if you really care about someone why don’t you celebrate them WHENEVER? Isn’t it a greater gesture when you surprise someone on a regular non-holiday day? Instead of scrambling to bake a sorry excuse of a cake or make a crappy paperweight at the last minute? Come on now! Go ahead. Splurge (with reason or monetary means) on that 5 course meal or buy that drag queen bling you have been shy about. You deserve it! Celebrate your fabulosity and ability to treat yo’self to EXACTLY what you please! Maybe you aren’t in a conventional relationship right now, but I guarantee that you are loved by many! If not many definitely some, but believe me people care about you more than you think! If you are drowning in your pity party reach for a hand. Your friends won’t know that you need them if you don’t let them know. Just be just sure to leave the tiny violin at home. Don’t roll your eyes at me either. I’m in the same [single] boat as you. My plans include working out, Tekken tag, wine and shrimp enchiladas. Naturally, I will spend time with friends in between. 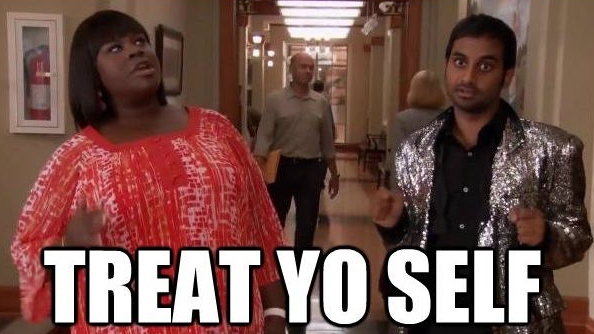 Bottom line: TREAT YO’SELF!! Celebrate you! Do something spontaneous you couldn’t otherwise do while in a couple. It’s okay to feel good and pamper yourself. If you don’t who will? 1 Response to "If Your Single and You Know It Clap Your Hands!"